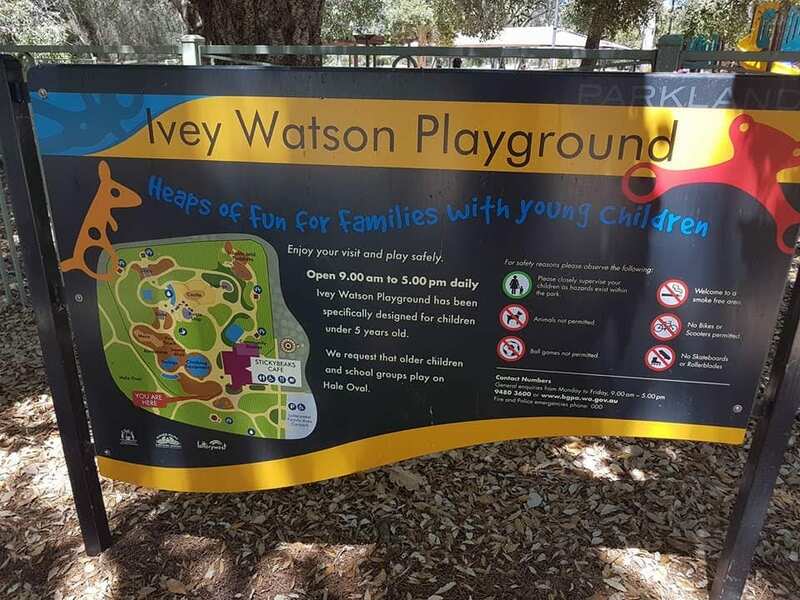 Ivy Watson Playground, also known as Stickybeaks playground in Kings Park is a great playground built specifically for 6 year olds and under. 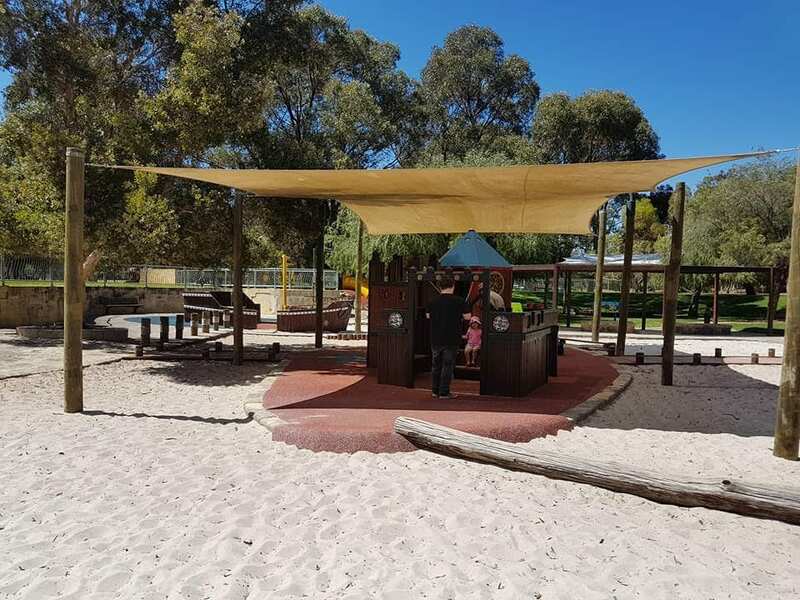 The area is fenced but it is large with several different play areas and can get very busy so you’ll need to keep an eye on your little ones. 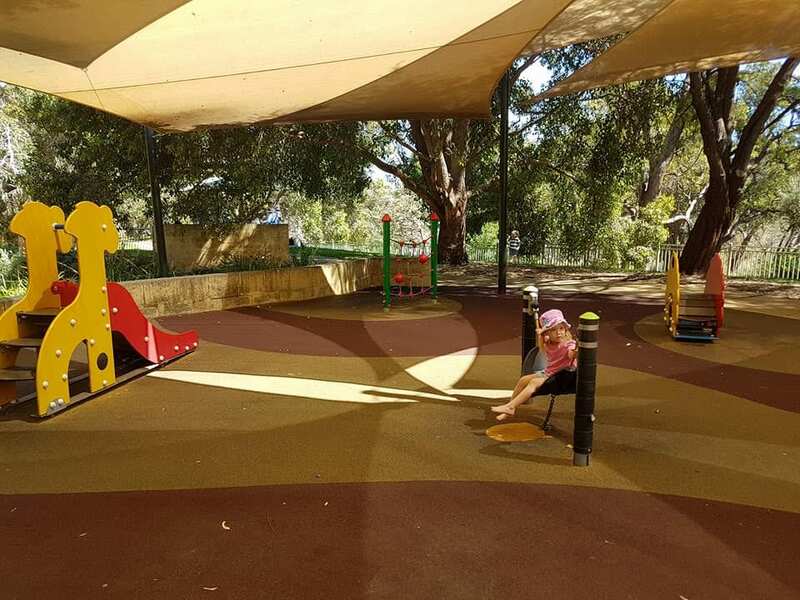 The playground is accessible via Kings Park Road with plenty of parking available. 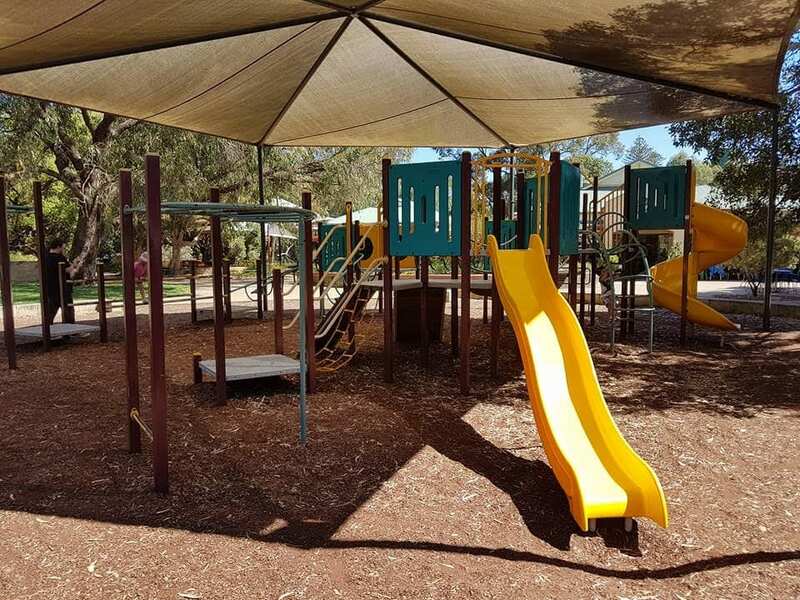 As you enter the playground the first play area you see is a large climbing frame with slides, monkey bars and balancing logs. 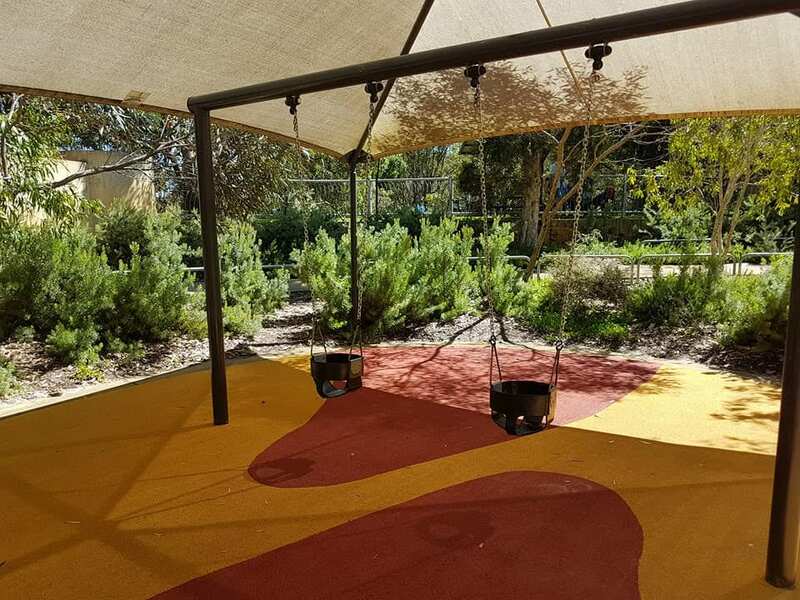 The area is under shade sails and on a wood chip base. 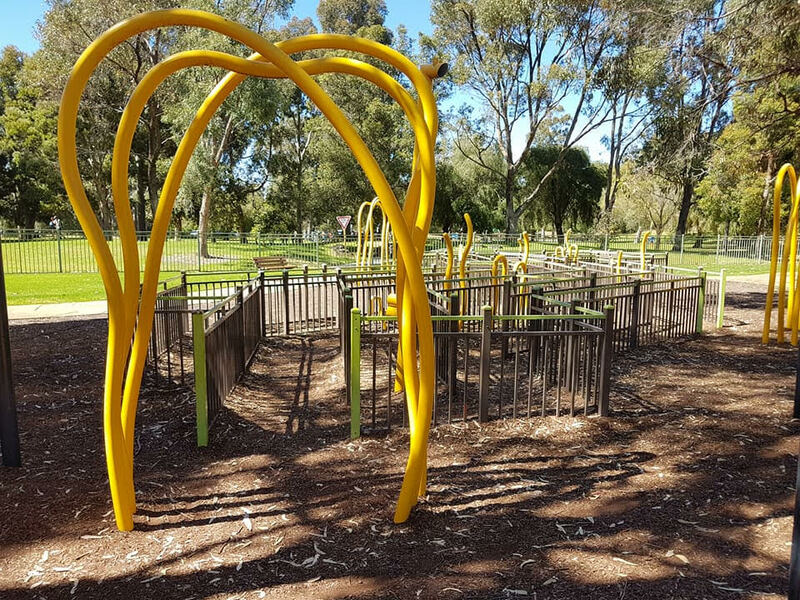 This area is suited to the older range of children due to the climbing and balancing nature of the equipment. 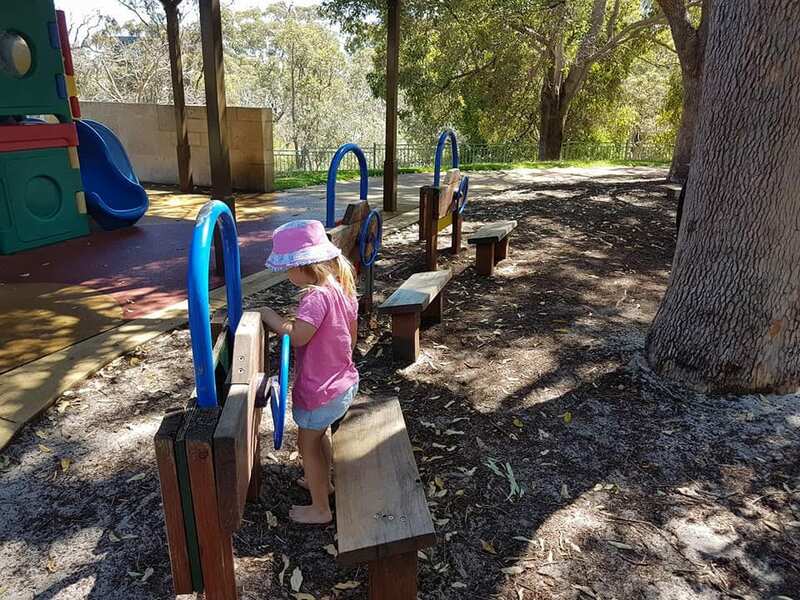 Miss 3.5 could manage the climbing structure well but the monkey bars were a bit advanced for her. 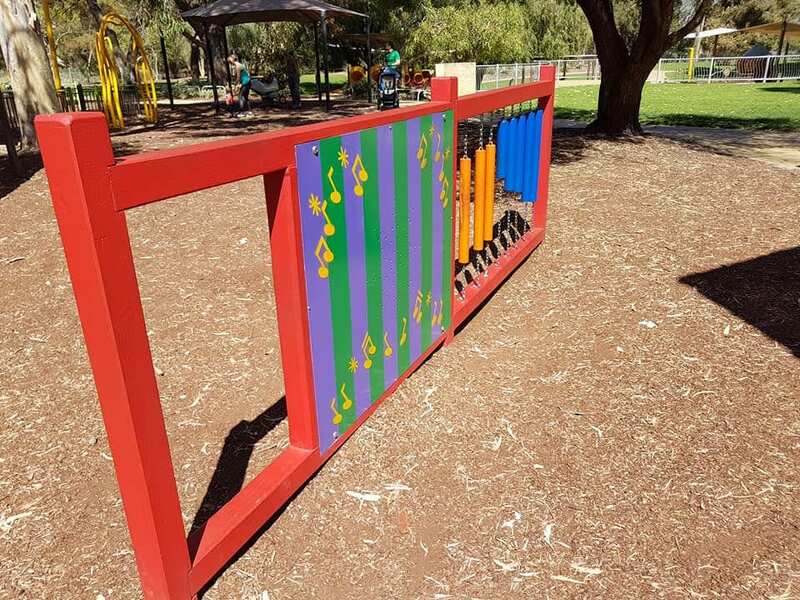 Near this area are musical instruments, a set of four swings, a maze, an aeroplane and a fire engine which are always popular for all ages. 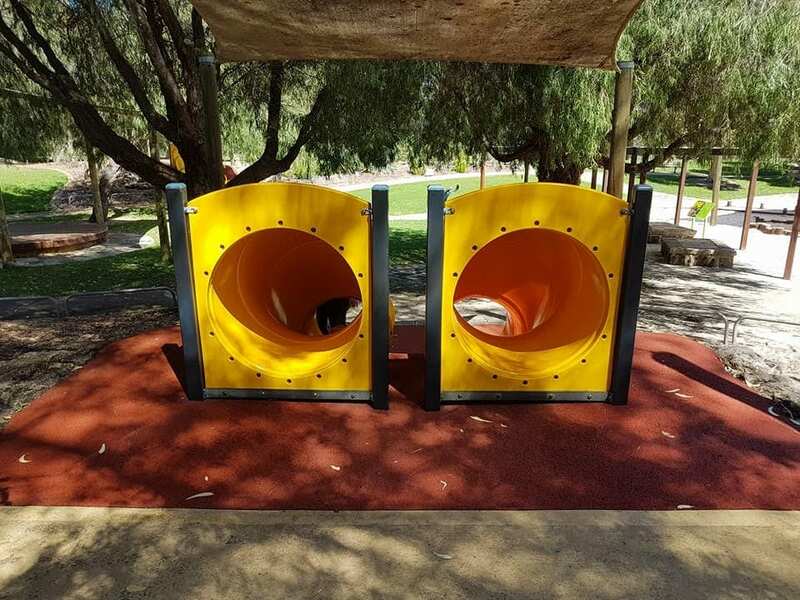 A pair of enclosed slides leads you down a small hill to the next playground. There is also another set of enclosed slides opposite these. 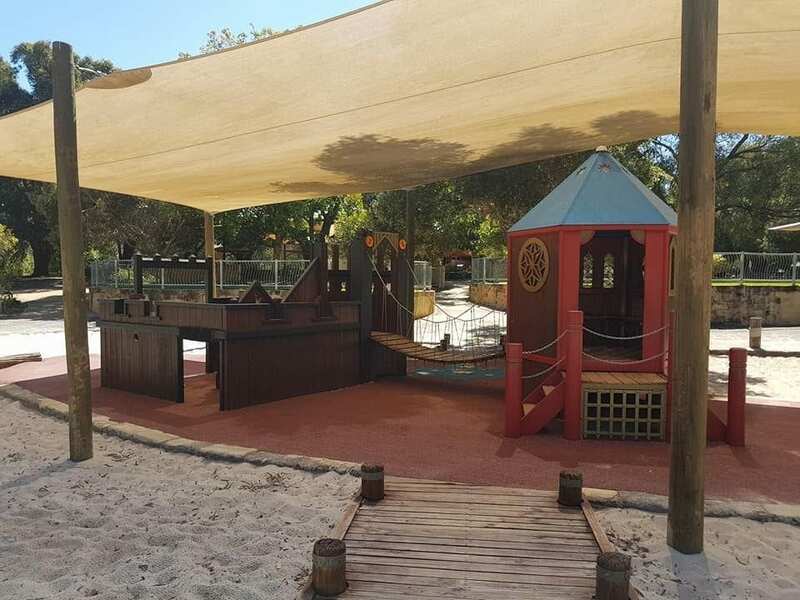 The playground at the bottom of the slides is a mainly sand based with a pirate ship and a castle. These are great for imaginative play and kept my 3.5 year old daughter entertained for ages. 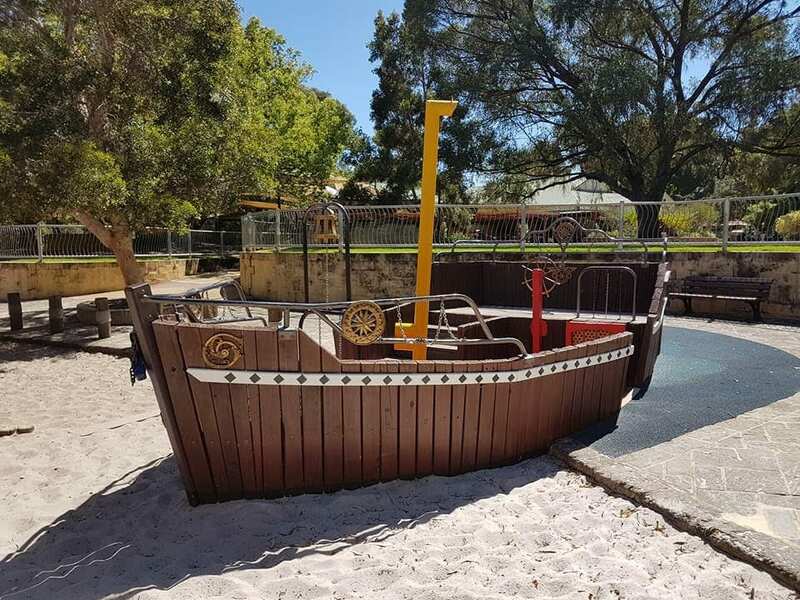 The pirate ship doesn’t have any shade so it can get warm in the heat of the day. Around the castle and ship are balancing logs and stepping stones. Tucked away near this area is a set of two toddler swings. 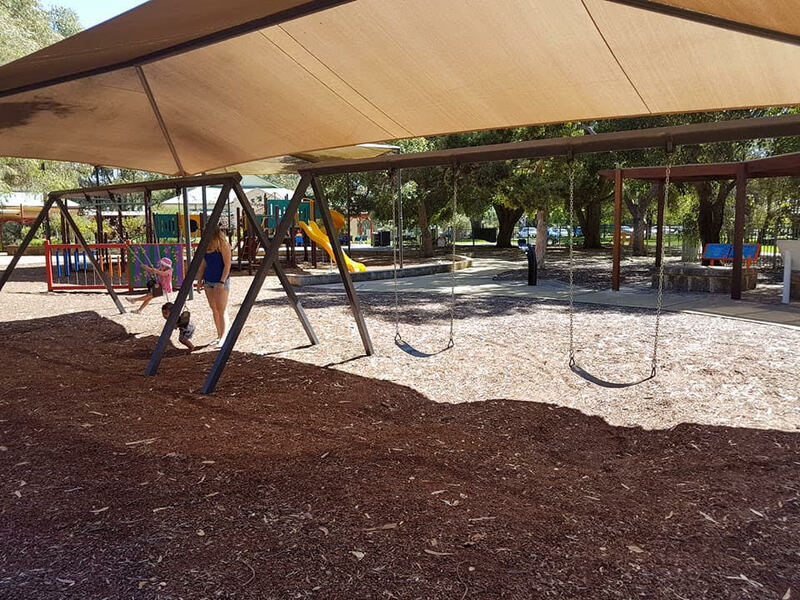 These are over a soft fall base and covered by shade sail. 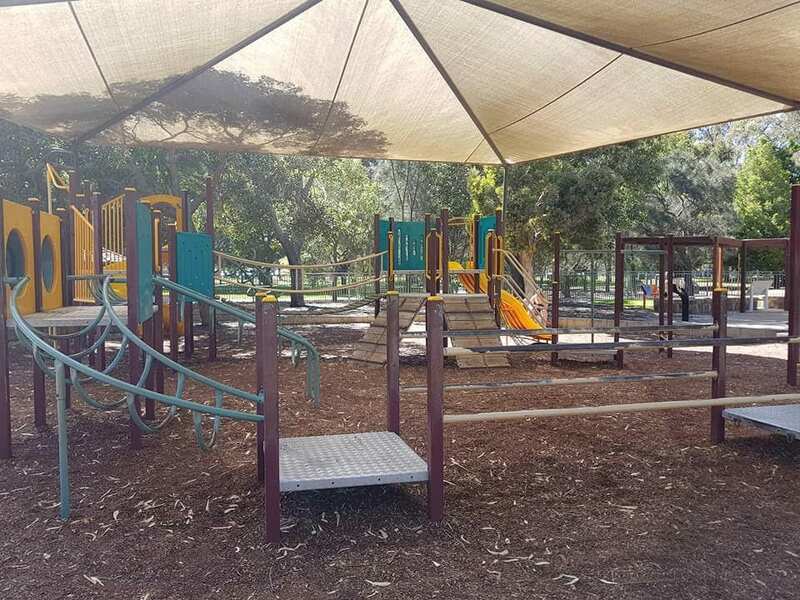 Near this playground is some nice grassed areas, covered picnic tables, and areas to sit. 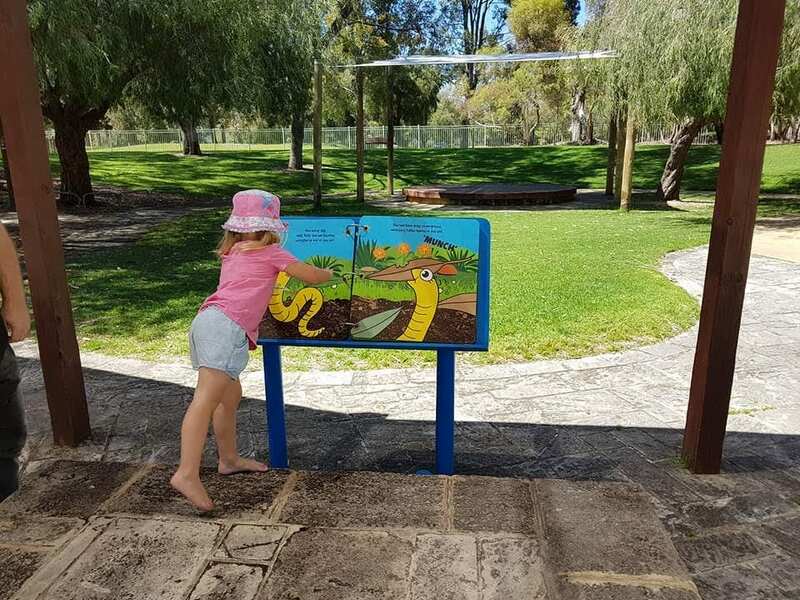 Around these two playgrounds there are some giant books that tell stories based in and around the playground. To the side of Stickybeaks Cafe is a large undercover area that can be hired and holds up to 80 people. Here you will also find toilets including a parents room and disabled toilet. 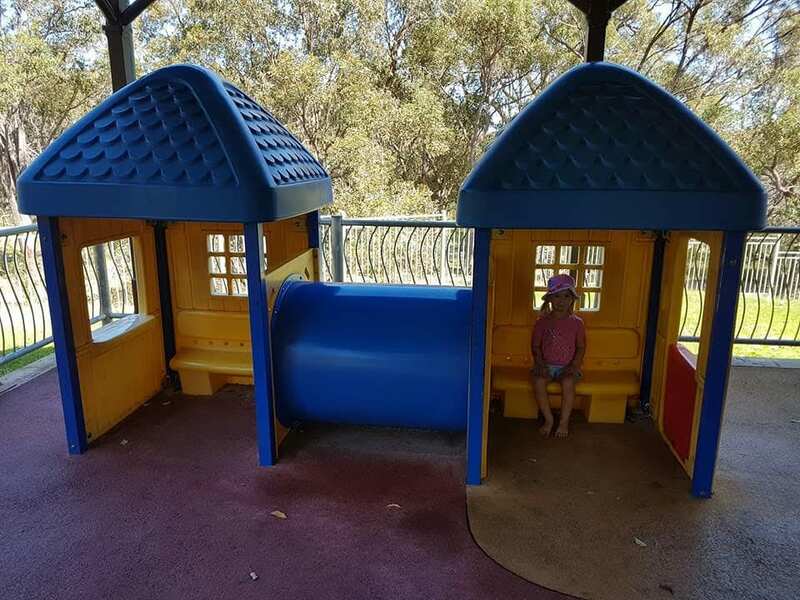 Next to this is a good play area for toddlers. 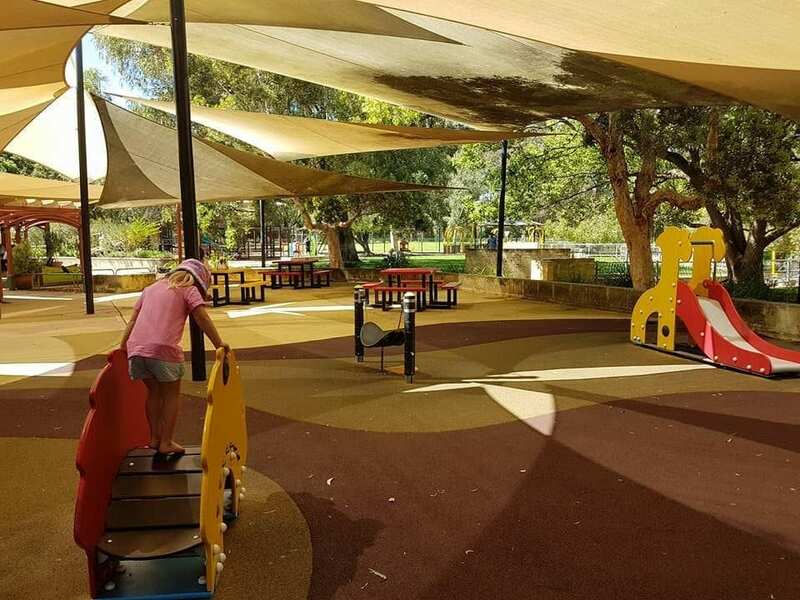 It has some sensory play equipment, scramble net, a small slide and small bridge. 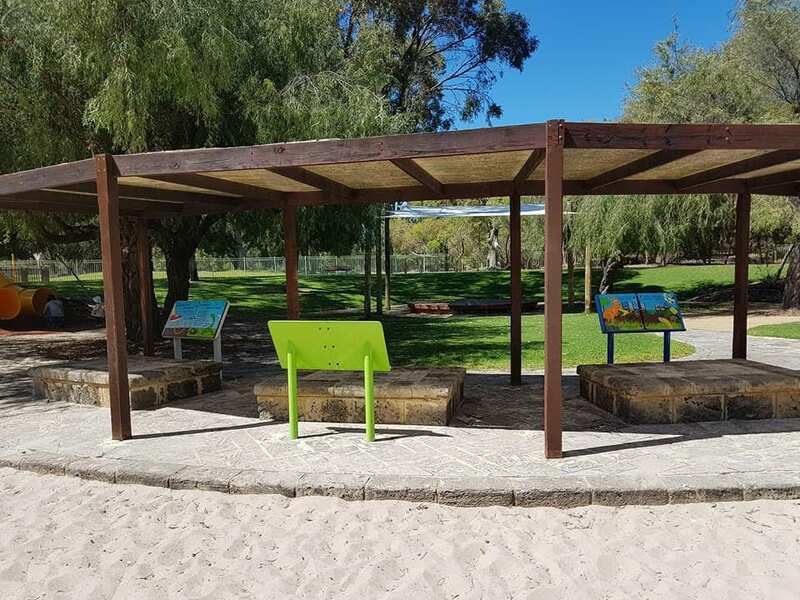 There are some bright picnic tables at the end of this play area so you could sit and have something from the nearby Stickybeaks Cafe while you watch the kids play. 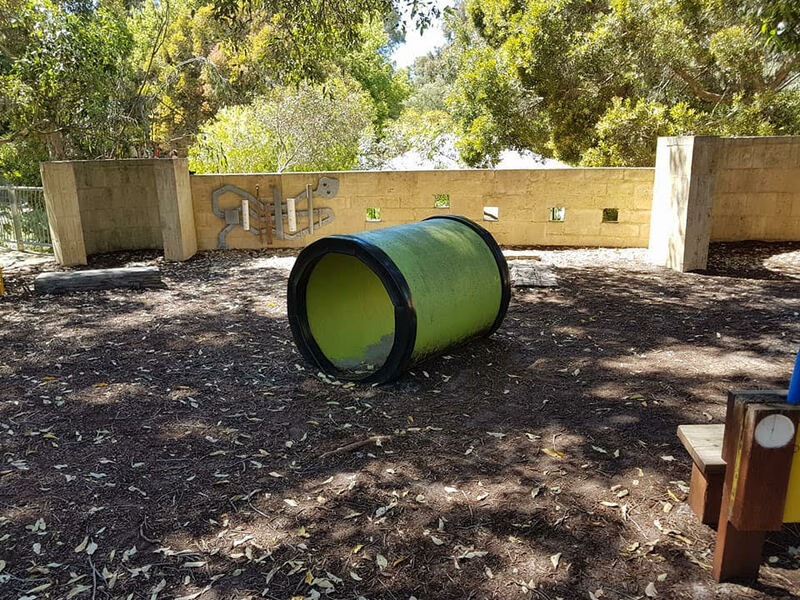 Further round a little is a larger play area for toddlers. 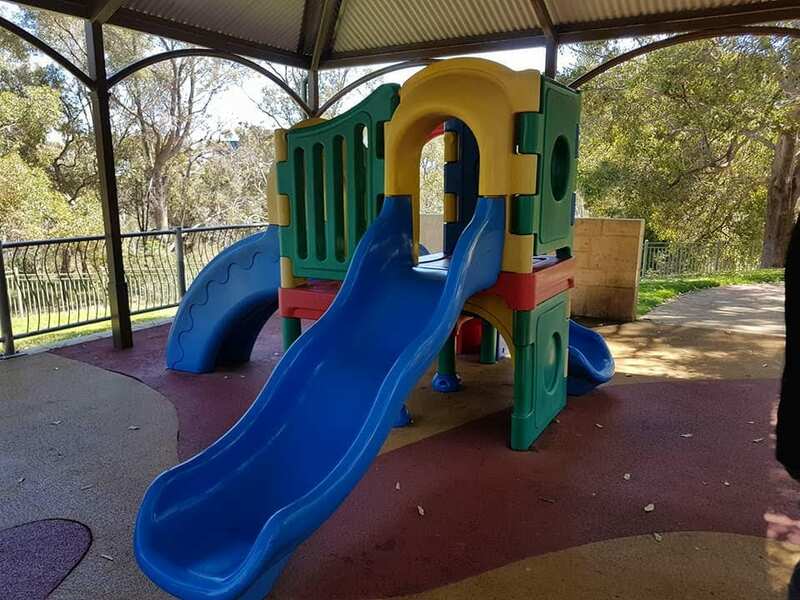 This has a climbing frame, slides, cubby house and one baby swing. This is all covered and on soft fall base. 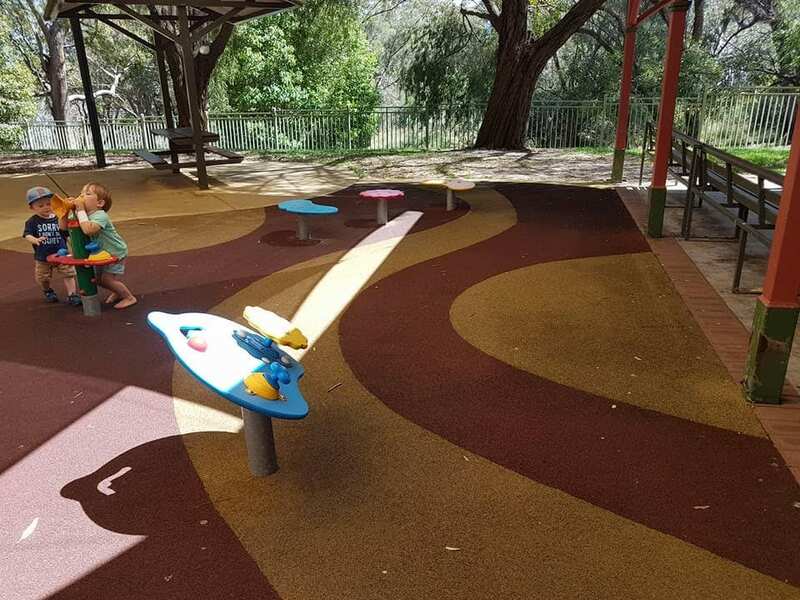 I like that this area also has a patch of grass and some sand for the little ones to play with. 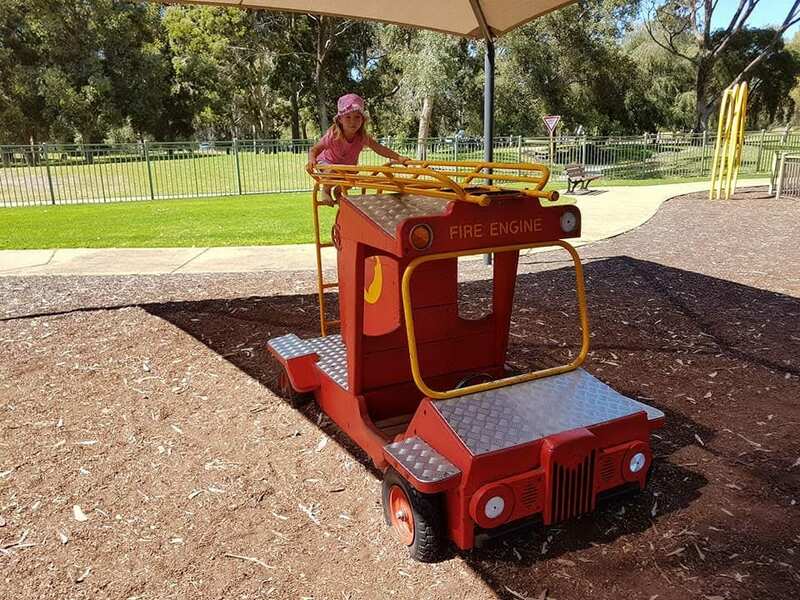 There is also three little bench cars and some obstacles to try. Within the fenced area is Stickybeaks Cafe which is open daily and offers breakfast, lunch and snack options. 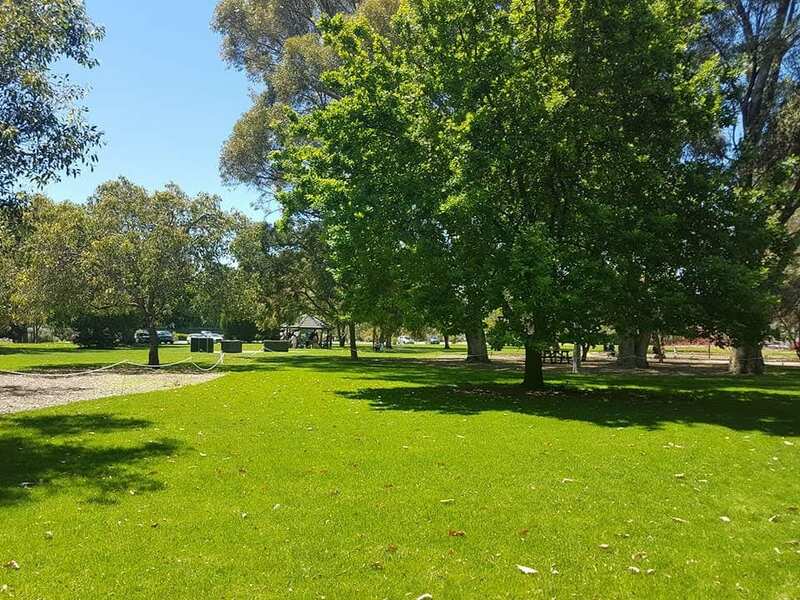 If you prefer to bring your own picnic there is plenty of nice grassed areas in or outside the fenced area. 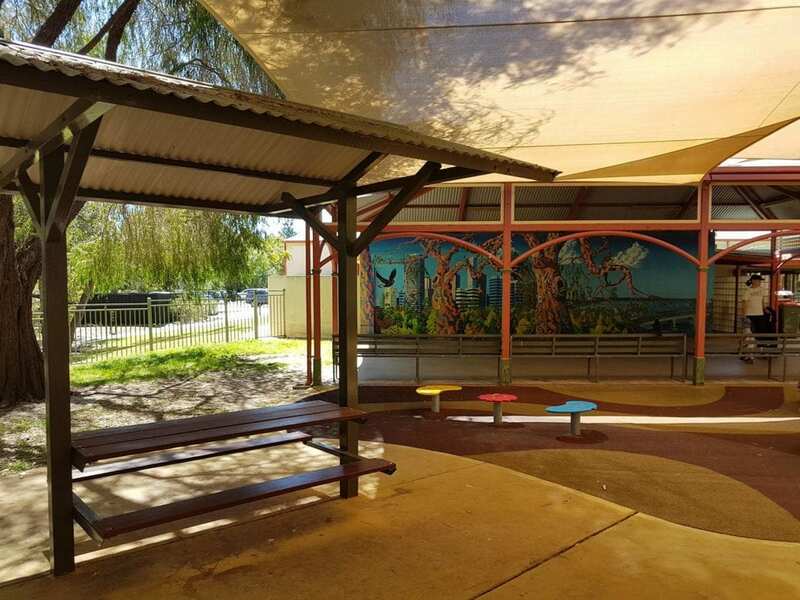 Inside the fenced area, there are a number of shaded picnic tables or benches within the different play areas. There are also several drink fountains. Outside the fenced area is a large grassy area called Hale Oval. 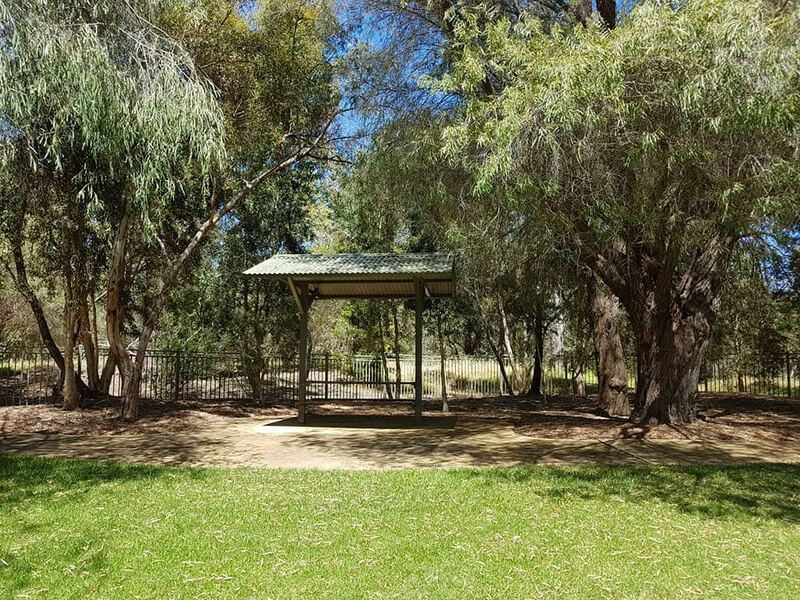 There are BBQs, gazebos and plenty of shady trees for a picnic. There is also a spider net for older children. 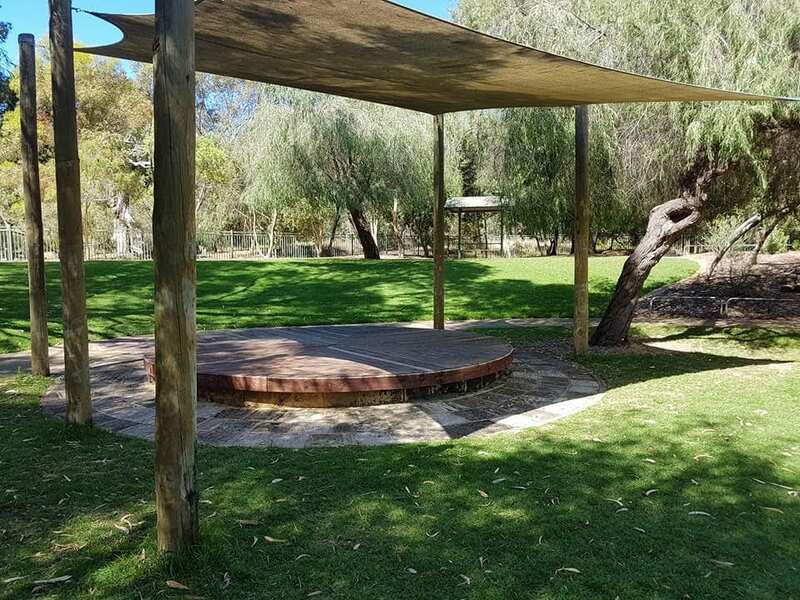 The gazebos can be hired for family functions or birthdays. Just outside the entrance to the fenced playground is a group of animal statues. These are the animals featured in the large books in the park. 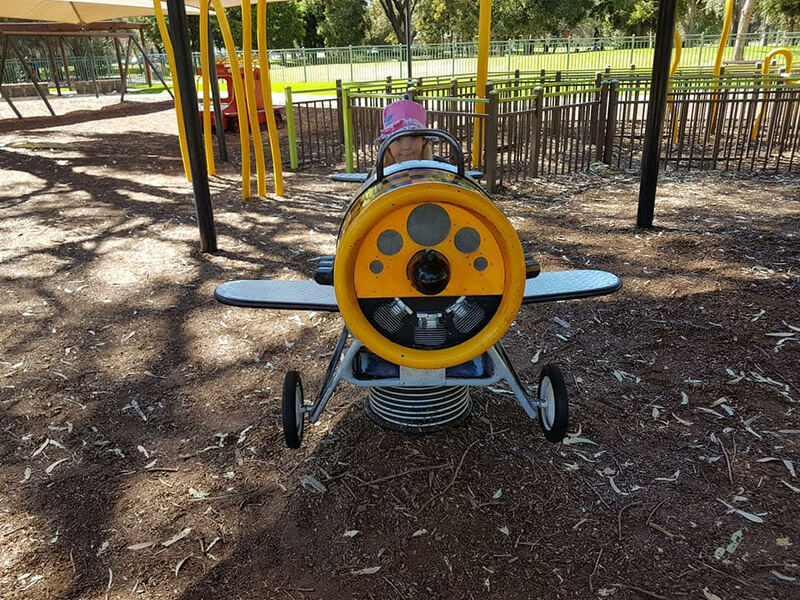 After reading a couple of the books Miss 3.5 was keen to play and explore these on the way out. 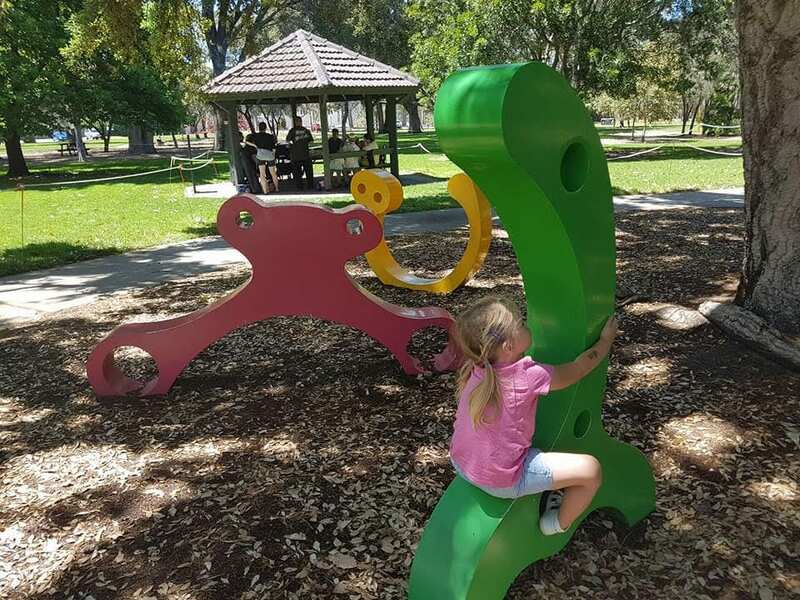 If you haven’t been to Ivy Watson Playground yet then you should, it really is a great park.